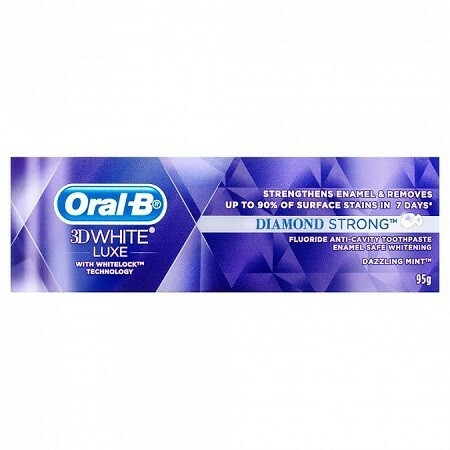 Oral-B 3D White Diamond Strong toothpaste with whitelock™ technology removes up to 90% of surface stains in just one week revealing a whiter smile. Paired with a Dazzling Mint flavor that keeps your breath feeling as fresh as your smile. Oral-B 3D White Luxe Diamond Strong Toothpaste removes stains for whiter teeth in 3 days (by removing surface stains) & strengthens enamel. – Whiter teeth in 3 days* (*Whitens teeth by removing surface stains. Individual results may vary). – Whiten by unlocking trapped surface stains. – Protects against new stains. – Leaves your smile clean and fresh. Do not swallow. Do not use this product in children 6 years of age or less. In case of intake of fluoride from other sources, consult a dentist or doctor. Contains Sodium Fluoride. Glycerin, Hydrated Silica, Sodium Polyphosphate, Water, PEG-6, Flavour, Trisodium Phosphate, Sodium Lauryl Sulfate, Sodium Saccharin, Carrageenan, Cocamidopropyl Betaine, Sodium Fluoride, Xanthan Gum, Mica, Sucralose, Sodium Benzoate, Citric Acid, Sodium Citrate, Potassium Sorbate, CI 77891, Titanium Dioxide.